It is difficult to believe I’ve only been here in Prague for a day and a half. That’s partly because I have been on the go so much and seen and done so many things already. It’s also , though, because I have hardly slept, so it’s been one‐and‐a‐half very long days. Allow me to break it down for you. How many modes of transportation (excluding walking) does it take to get from my house to my apartment in Prague? Car: My friend Mary drove me to the light rail station next to Husky Stadium. Tram/train or whatever it’s called to get to the South Satellite at SeaTac. Plane from SeaTac to Frankfurt. Bus from the gate to where our plane was parked. Plane from Frankfurt to Prague. Car from the airport to the apartment. Nowadays I consider it a great trip when you arrive safely, so it was a great trip, even though I barely slept during the nine‐hour flight across the pond. I got to my apartment at 2:00 pm, and it wasn’t ready yet, so I dropped my luggage and went for a walk. I came back at 3:00 and the apartment manager gave me a great rundown of places to go, marking things to see, important sights, and good restaurants on a map before taking me to my apartment. I’m upstairs overlooking a courtyard, and even though I’m in the heart of the old town and there’s a lot of activity on the street, the apartment is completely quiet. Between friends who have been here and other recommendations, I have enough restaurant suggestions to last me a month in Prague. I was going to hit up one of the suggestions last night before my nighttime walking tour of Prague Castle, but by the time I was hungry and then found it, there wasn’t enough time, so I hit up another spot that seemed relatively quick and had a traditional meal of duck breast with red cabbage and gnocchi. It was good. … and that’s where I trailed off last night before I crashed. … but the tour was exceptionally good. It was just me and a family of three (parents and adult daughter) from California. The guide was an American who’s been living here for five years and did her masters in eastern European studies. She definitely knew her stuff and shared a lot of detailed history, which I soaked up at the time and have since mostly forgotten. 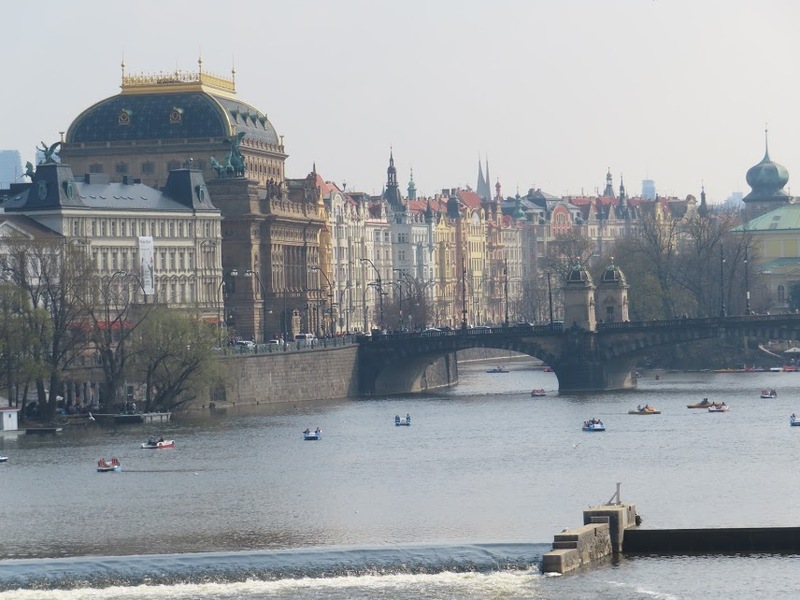 What I couldn’t escape during the tour, or before, or afterwards, or any time since, is what a beautiful city Prague is. 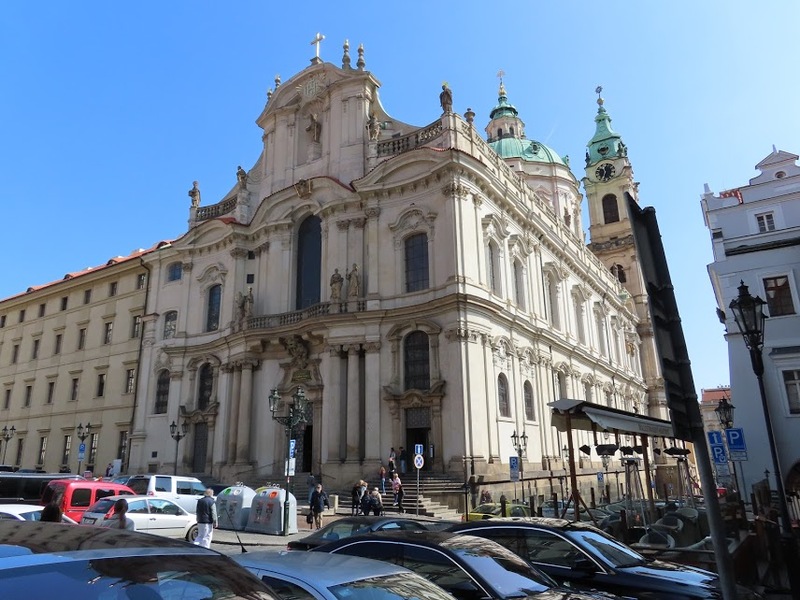 While the city dates back to the 800s, Prague and all of Bohemia were ruled by the Hapsburgs from Vienna from 1526 until 1918, when Czechoslovakia became an independent republic. 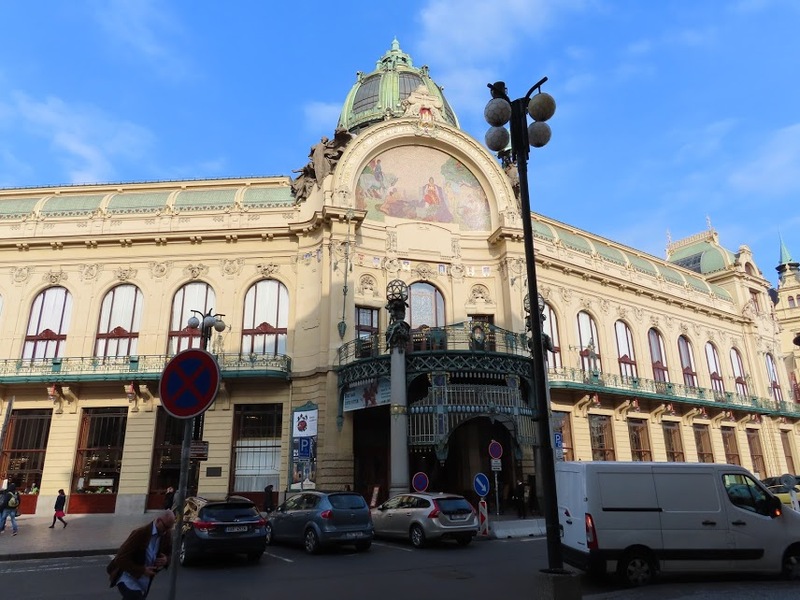 While Hapsburg rule might not have been appreciated by the Czech people, it resulted in a city filled with gorgeous Viennese buildings, many of which were at one time the houses of wealthy citizens. Then, following independence, a number of beautiful art deco buildings were constructed. The communist era didn’t really affect the look of the Old Town, but on the outskirts are a number of communist‐era brutalist offices and apartment buildings. 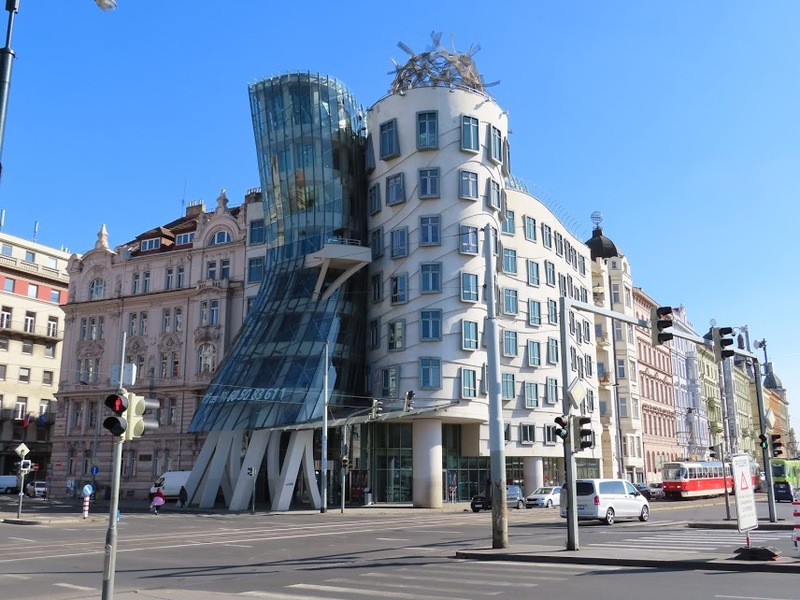 The overwhelming dominance of Viennese architecture is, for me, what makes Prague such a delightful city. Even the castle, the centerpiece of which is the Gothic St. Vitus Cathedral, is otherwise filled with 19th century Viennese‐style construction. And couldn’t get back to sleep for the rest of the night. Finally, at 6:00 yesterday, I gave up and got ready to start the day. Here’s a sampling. The architectural variety is remarkable I think. 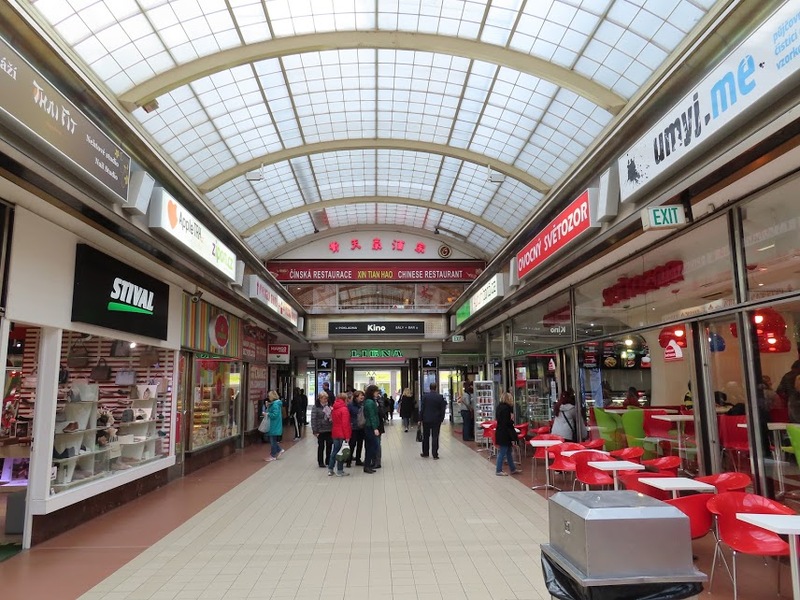 The Pasáž Světozor, a Communist‐era shopping passage. 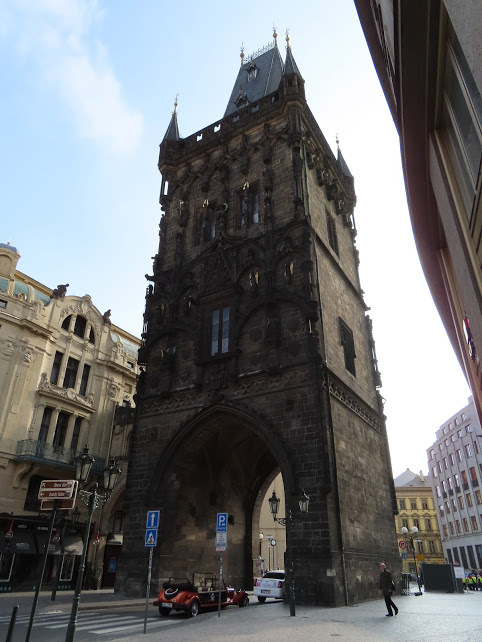 Suffice it to say, the more I saw and learned, the more enchanting Prague became. It is a city that is so easy to love. It’s also a city that is teeming with tourists. 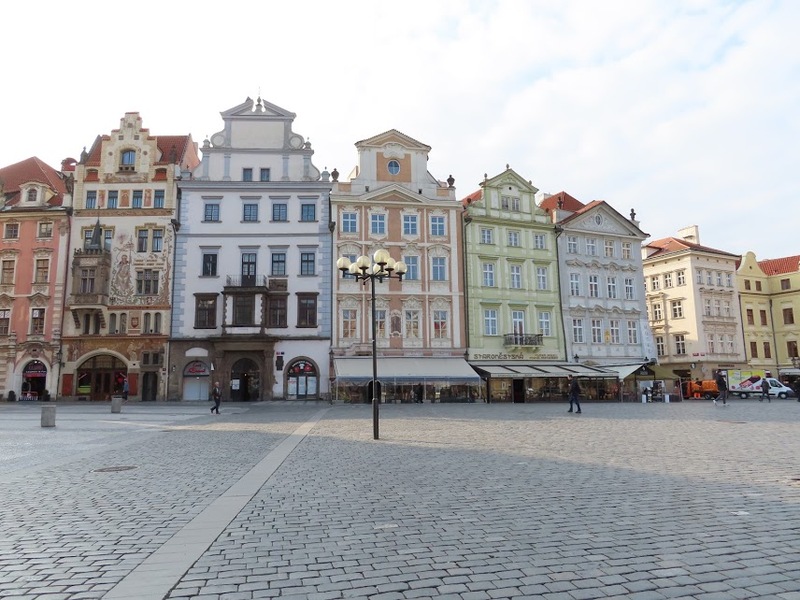 The biggest crowds are concentrated near the Old Town Square, on the pedestrian‐only street where my apartment is and which leads from the square to the Charles Bridge, and in and around Prague Castle, on the other side of the Vltava River. The day I arrived, Sunday, was especially busy. I thought I would be too early for the big tourist rush, but I had to wonder, if it’s like this on the last day of March, what must it be like in May, June, July, and August? The Naked Tour guide (who wasn’t actually naked; that’s just the name of the company that did the nighttime tour of the castle) said it was the first nice spring weekend, and the first day of Summer Time (what they call Daylight Saving Time), so it wasn’t just tourists but also a lot of locals who were out enjoying the day. But wherever I go I run into hordes of tourists. And there are so many walking tours going on, some with huge groups in tow. There are probably as many Starbucks here as in Seattle. There are two in the Old Town Square. Mischa and I finished our tour at a Starbucks not far from the Castle, where we met Martina, my local representative from JayWay. We sat and chatted for a while, and then I took off to go back to the castle to see St. Vitus Cathedral, which was closed at night. On the way I stopped at St. Nicholas Church and enjoyed several gorgeous views of the old town across the river. Looking at the map, I can hardly believe how much I walked yesterday between the tour with Mischa and the additional walking I did on my own. From the castle I walked back down the hill through a vineyard, stopped in the garden of the Wallenstein Palace, which is probably lovely a little later in the spring, then walked along the river to check out the Dancing House (aka Ginger & Fred). Finally, I decided it was time for a break before dinner and my first concert of the trip. I don’t know where the energy for all that walking came from on roughly four hours’ sleep over the last 48 hours, but as soon as I sat down in my apartment, I realized how severely I was in need of a nap. When I woke up, I didn’t have time for dinner before the concert, and I was starving (I’d eaten only a light breakfast and an even lighter lunch). So I bought some nuts at a convenience store and scarfed them down before the concert. The Dvořák Stabat Mater is a piece I became familiar with in grad school, but this is the first time I’ve heard a live performance. 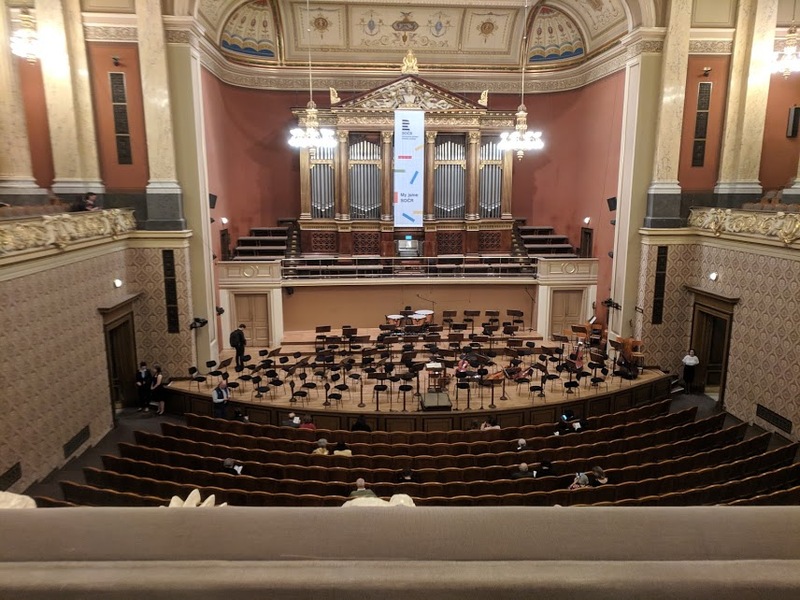 I think Dvořák’s music is more commonly performed here than in the US. Not surprising. Programs are not free. The usher was kind enough to look through it to see if there was anything in English. There wasn’t, so I didn’t buy one. Most of the men wore suits or coats and ties. And virtually everyone checked their coats, and the entire lobby was lined with coat checks to accommodate them all. At the end of the concert there was a long line at all of them. After the concert I was starving, but I didn’t want to sit down for a big dinner, so I got a “hot dog” from one of the ubiquitous street vendors. It was actually an enormous sausage that didn’t nearly fit in the bun, which was filled with rocket, jalapeno, cheese, and sauerkraut as well as a choice of condiments including mustard, ketchup, mayonnaise, and a few other things I didn’t recognize nor understand why someone would put it on a hot dog. I went with mustard, and it was yummy. And I started this blog post when I got back to my apartment. But I didn’t get far. I fell quickly asleep by about 11 and woke feeling refreshed. I looked at my phone and was 1:40 am. And it took two hours before I was able to get back to sleep. And this time I slept until 10 am. Next post I’ll pick it up from there.